This is a guide for novice QIIME 2 users, and particularly for those who are new to microbiome research. For experienced users who are already well versed in microbiome analysis, and those who are adverse to uncontrolled use of emoji, mosey on over to the overview tutorial for experienced users. Each type of data (i.e., Artifacts and Visualizations) and action (i.e., methods, visualizers, and pipelines) is represented by a different color-coded node. The edges connecting each node is either solid (representing either required input or output) or dashed (representing optional input). Don’t know what these terms mean? Arrgh! Read the note at the top of this page. Actions are labeled with the name of the plugin and the name of the action. To use that action, type “qiime” and then the text contained in that node. E.g., qiime demux emp-single. Artifacts are labeled with the semantic type of that file. Don’t worry — you will not need to type out those long names unless if you need to import a file into that format. The flowcharts below are designed to be as simple as possible, and hence omit many of the inputs (particularly optional inputs and metadata) and outputs (particularly statistical summaries and other minor outputs) and all of the possible parameters from most actions. Many additional actions (e.g., for displaying statistical summaries or fiddling with feature tables 🎻) are also omitted. Now that you know all about the help documentation, use it to learn more about individual actions, and other actions present in a plugin (hint: if a plugin has additional actions not described here, they are probably used to examine the output of other actions in that plugin). The edges and nodes in this overview do not represent specific actions or data types, but instead represent conceptual categories, e.g., the basic types of data or analytical goals we might have in an experiment. All of these steps and terms are discussed in more detail below. 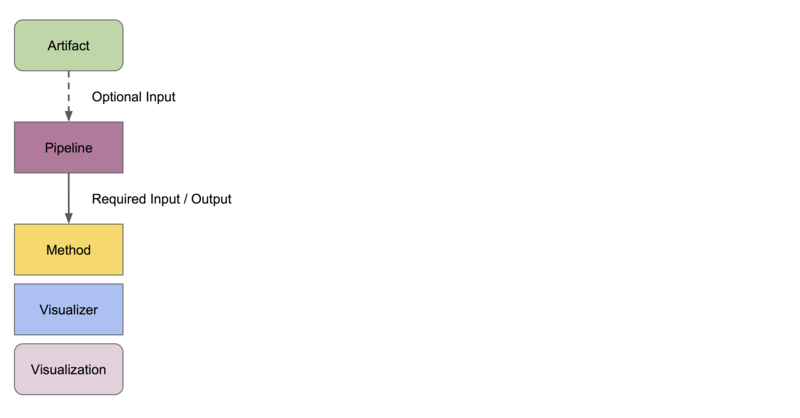 All data must be imported as a QIIME 2 artifact to be used by a QIIME 2 action (with the exception of some metadata). Different users may enter this workflow at different stages. Most will have some type of raw sequence (e.g., FASTQ or FASTA) data, which should be imported following the appropriate sequence importing scheme. Other users may start with demultiplexed sequence data, or even a feature table given to them by a collaborator. The importing tutorial covers the most common data types that users need to import into QIIME 2. Now that we understand that we can actually enter into this overview workflow at nearly any of the nodes, let us walk through individual sections. All amplicon/metagenome sequencing experiments begin, at some point or another, as raw sequence data. This is probably FASTQ data, containing DNA sequences and quality scores for each base. We must demultiplex these reads to determine which sample each read came from. The resulting feature table and representative sequences are key pieces of data. Don’t lose them! A feature table is essentially a matrix of samples x observations, i.e., the number of times each “feature” (OTUs, ASVs, etc) is observed in each sample in a data set. 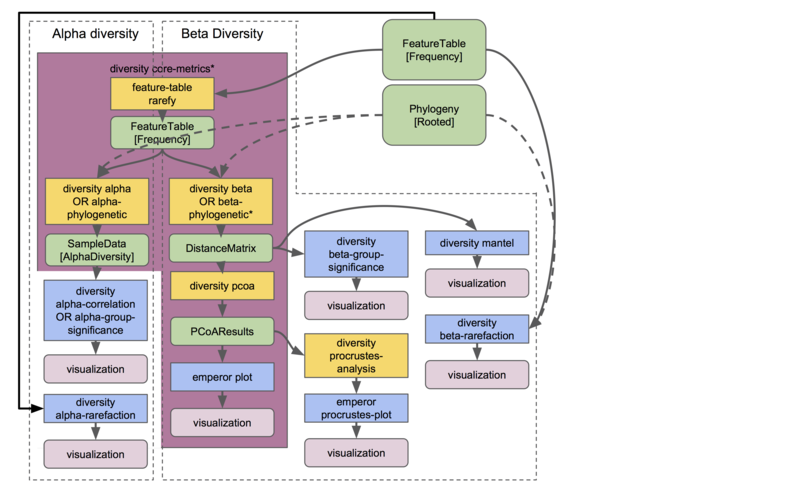 Many diversity analyses rely on the phylogenetic similarity between individual features. If you are sequencing phylogenetic markers (e.g., 16S rRNA genes), you can align these sequences to assess the phylogenetic relationship between each of your features. Differential abundance measurements determine which features (OTUs, ASVs, taxa, etc) are significantly more/less abundant in different experimental groups. Okay! Imagine we have just received some FASTQ data, hot off the sequencing instrument. Most next-gen sequencing instruments have the capacity to analyze hundreds or even thousands of samples in a single lane/run; we do so by multiplexing these samples, which is just a fancy word for mixing a whole bunch of stuff together. How do we know which sample each read came from? This is typically done by appending a unique barcode (a.k.a. index or tag) sequence to one or both ends of each sequence. Detecting these barcode sequences and mapping them back to the samples they belong to allows us to demultiplex our sequences. Want to get started demultiplexing? You (or whoever prepared and sequenced your samples) should know which barcode belongs to each sample — if you do not know, talk to your lab mates or sequencing center. Include this barcode information in your sample metadata file. This flowchart describes all demultiplexing steps that are currently possible in QIIME 2, depending on the type of raw data you have imported. Usually only one of the different demultiplexing actions available in q2-demux or q2-cutadapt will be applicable for your data, and that is all you will need. Let’s start with denoising, which is depicted on the right-hand side of the demultiplexing and denoising workflow. The OTU clustering tutorial demonstrates use of several q2-vsearch clustering methods. Don’t forget to read the chimera filtering tutorial! Want to see which sequences are associated with each feature ID? Use qiime metadata tabulate with your FeatureData[Sequence] artifact as input. q2-feature-classifier contains three different classification methods. classify-consensus-blast and classify-consensus-vsearch are both alignment-based methods that find a consensus assignment across N top hits. These methods take reference database FeatureData[Taxonomy] and FeatureData[Sequence] files directly, and do not need to be pre-trained. 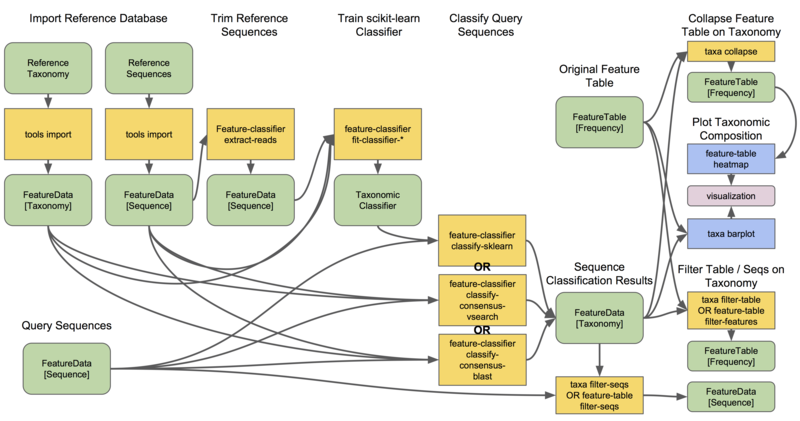 Machine-learning-based classification methods are available through classify-sklearn, and theoretically can apply any of the classification methods available in scikit-learn. 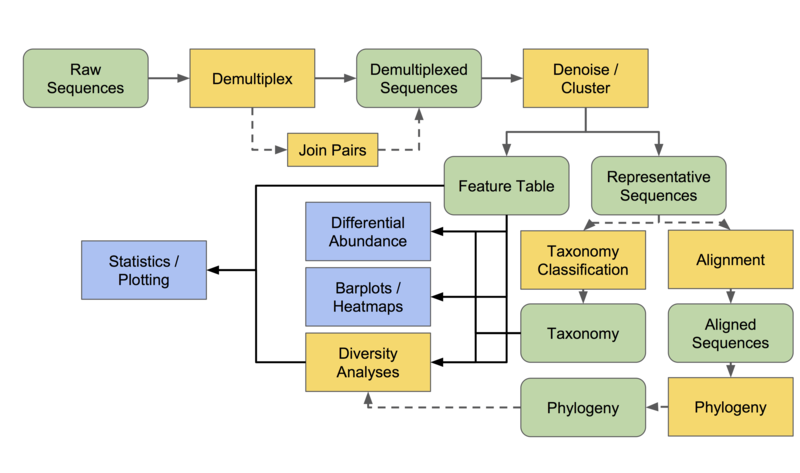 These classifiers must be trained, e.g., to learn which features best distinguish each taxonomic group, adding an additional step to the classification process. Classifier training is reference database- and marker-gene-specific and only needs to happen once per marker-gene/reference database combination; that classifier may then be re-used as many times as you like without needing to re-train! Which method is best? They are all pretty good, otherwise we wouldn’t bother exposing them here. 😎 But in general classify-sklearn with a Naive Bayes classifier can slightly outperform other methods we’ve tested based on several criteria for classification of 16S rRNA gene and fungal ITS sequences. It can be more difficult and frustrating for some users, however, since it requires that additional training step. That training step can be memory intensive, becoming a barrier for some users who are unable to use the pre-trained classifiers. Some users also prefer the alignment-based methods because their mode of operation is much more transparent and their parameters easier to manipulate (see the link above for description of these parameters and recommended settings for different applications). Examples of using classify-sklearn are shown in the feature classifier tutorial and in the moving pictures tutorial. The taxonomy flowchart should make the other classifier methods reasonably clear. All classifiers produce a FeatureData[Taxonomy] artifact containing a list of taxonomy classifications for each query sequence. Want to see which sequences and taxonomic assignments are associated with each feature ID? Use qiime metadata tabulate with your FeatureData[Taxonomy] and FeatureData[Sequence] artifacts as input. 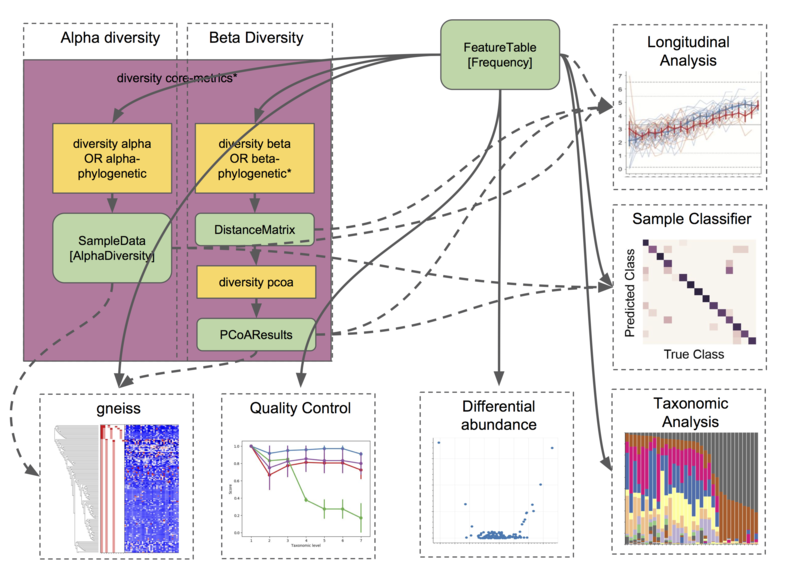 Many diversity analyses rely on the phylogenetic similarity between individual features. 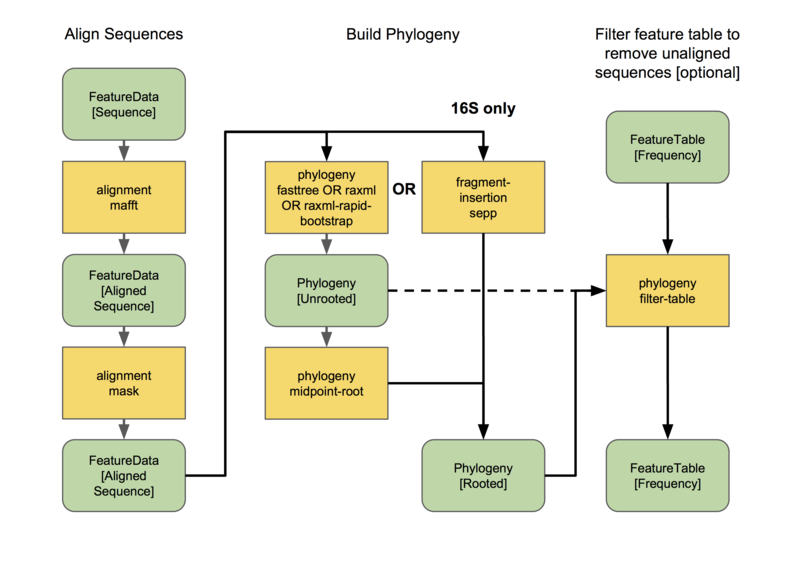 If you are sequencing phylogenetic markers (e.g., 16S rRNA genes), you can align these sequences to assess the phylogenetic relationship between each of your features. This phylogeny can then be used by other downstream analyses, such as UniFrac distance analyses. How many different species/OTUs/ASVs are present in my samples? How much phylogenetic diversity is present in each sample? How similar/different are individual samples and groups of samples? What factors (e.g., pH, elevation, blood pressure, body site, or host species just to name a few examples) are associated with differences in microbial composition and biodiversity? And more. These questions can be answered by alpha- and beta-diversity analyses. Alpha diversity measures the level of diversity within individual samples. Beta diversity measures the level of diversity or dissimilarity between samples. We can then use this information to statistically test whether alpha diversity is different between groups of samples (indicating, e.g., that those groups have more/less species richness) and whether beta diversity is greater between groups (indicating, e.g., that samples within a group are more similar to each other than those in another group, suggesting that membership within these groups is shaping the microbial composition of those samples). SampleData[AlphaDiversity] artifacts, which contain alpha diversity estimates for each sample in your feature table. This is the chief artifact for alpha diversity analyses. DistanceMatrix artifacts, containing the pairwise distance/dissimilarity between each pair of samples in your feature table. This is the chief artifact for beta diversity analyses. PCoAResults artifacts, containing principal coordinates ordination results for each distance/dissimilarity metric. Principal coordinates analysis is a dimension reduction technique, facilitating visual comparisons of sample (dis)simmilarities in 2D or 3D space.